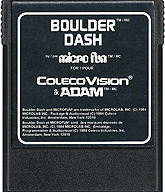 ColecoVision.dk presents: Boulder Dash © 1984 by: Exidy Inc.
ColecoVision Cartridge #, Casing and Producent: None, Standard Black U.S. Style, this version Moldex Canada. ColecoVision Manual Layout and Design by: First Star Software Inc., Telegames USA. 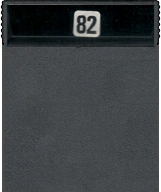 ColecoVision Manual # and Manufacturer: Unknown, First Star Software Inc., Telegames USA. 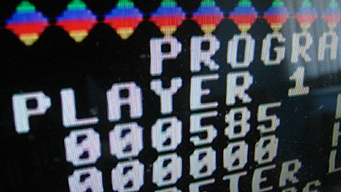 Pause Feature: Yes, press "0" and then "8"
Further development of the old game: The Pit from 1982. Join Rockford and experience the execitement and beauty that awaits you. An addictive mixture of challenge, strategy, reflex and charm. Collect the required number of jewels and the mysterious escape tunnel is awarded. Can you and Rockford master the enchanted walls, transform butterflies into jewels and escape the growing amoeba. ? Journey through 16 different mystical caves. Brilliant colors and graphics dazzle your senses. Puzzling dilemmas challenge your skills in each of the 5 different levels of difficulty. Win 4 consecutive games and be rewarded with a playable bonus intermission. 16 caves / 5 levels of difficulty - Playable intermissions - 324 different screens. High Score For The ColecoVision Version Of: Boulder Dash. XName: Tom Duncan. XName: Northcoastgamer. Name: Ole Nielsen. 1st XScore: 002434 - August 08, 2005. 1st XScore: 003113 - February 17, 2017. 1st XScore: 000585 - August 18, 2015. Name: Troy Whelan. Name: Bmack36. Name: Ole Nielsen. 2nd XScore: 002376 - July 06, 2004. 2nd XScore: 002234 - January 28, 2017. 2nd XScore: 000476 - March 01, 2015. Name: James Carter. Name: DuggerVideoGames. Name: Ole Nielsen. Name: Name: Mangia-Boy. Name: Ole Nielsen. ColecoVision.dk Game # 82, Boulder Dash is last updated: March 31, 2019.